Our size guide is designed to try and help you find the best fitting Guilty bangle for you. All of our bangles are measured by their internal diameter, which means we simply use a ruler and place it across the centre of the bangle and take the internal measurement in mm. Our bangles have their internal diameter given in the specifications tab at the bottom of each bangle page. We recommend if you have a bangle at home that fits you well, measure its internal diameter and this is your guide as to which size bangle you need. We at Guilty Bangles have a stunning range of exclusive bangles made by our brilliant silversmith and in this range we are able to offer most of these bangles in small, regular and large wrist size. We at Guilty Bangles have a stunning range of exclusive bangles made by our brilliant silversmith and in this range we are able to offer most of these bangles in extra small, small, regular, large and extra large wrist size. Extra Small Size Bangle: Internal diameter of 57mm -> Click here for our small wrist silver bangles collection. Small Size Bangle: Internal diameter of 60mm or 61mm -> Click here for our small wrist silver bangles collection. 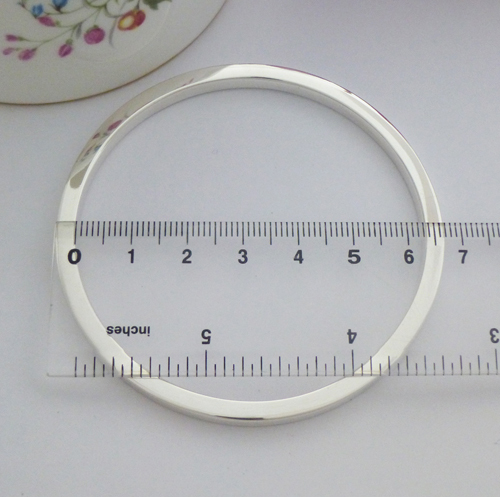 Regular Size Bangle: Internal Diameter of 63mm - 65mm, this size fits the majority of womens wrists. Large Size Bangle: Internal Diameter of 67mm or larger -> Click here for our large wrist silver bangles collection. Extra Large Size Bangle: Internal Diameter of 71mm -> Click here for our large wrist silver bangles collection. We recognise that women need not only a variety of fabulous sterling silver bangles to choose from, but also to have a bangle that fits well and is comfortable without compromising on quality. We always try to give you the measurements of our bangles on the bangle description or on the specifications tab, however if you can't find the measurement of a specific bangle, please contact us and we can give you the measurements. If you need more help to find the correct size bangle for you or you are looking to buy a bangle as a present for a friend or loved one and need advice, please do not hesitate to call me. I'm more than happy to discuss ways to find the right sized bangle for you but even if you order a bangle from Guilty and the size is incorrect, you will get a full refund in lines with our terms and conidtions relating to refunds.